Hello friends. Today I am happy to show you my first "postable" project using my handy dandy new Electronic Die-Cut machine the KNK Zing. This amaZING (lol) machine was part of the World Card Making Day package I won from Paper Crafts Magazine. Even after 2 months I still can't believe I was one of the winners. Anywho, I must admit I left the Zing in its box for a couple of weeks, I was scared of it! It isn't as easy to operate as my CricutEx, but last week I decided to take the plunge and open the box. The learning curve is steep, and I had a tough time getting it figured out, but after a few swears, (keepin' it real) and intense frustration, I am slowly starting to love my machine. Now onto my tags! 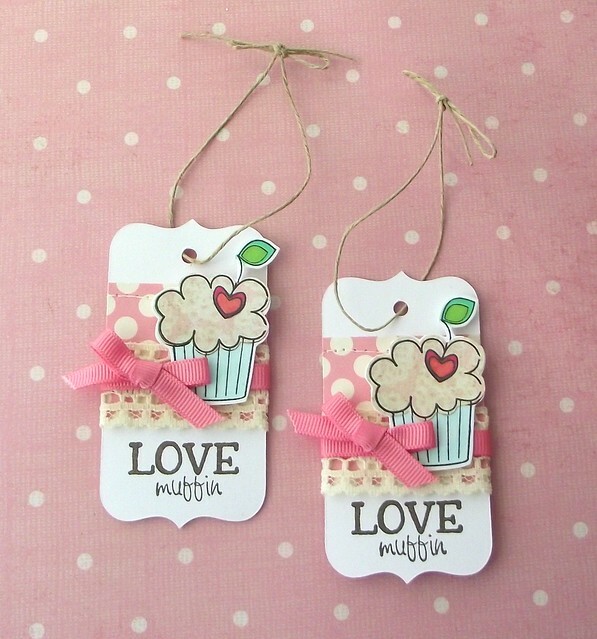 I used the Lettering Delights tag set " Basic Tags" to cut out my cute little tags. The stamp set I used is from one of my favorite stamp companies YNS Your Next Stamp, "Love Muffin". I stamped the cupcakes and colored the wrapper, heart, and leaf with Copic, Promarkers, and Sharpies. The muffin top was paper pieced using some adorable paper I just picked up from Hobby Lobby by Paper Studio. I added some vintage lace, regal rose grosgrain from SU, and patterned paper from October Afternoon. I finished off the tags with twine for tieing. I hope you like my tags, and keep an eye out for more projects using YNS, and my KNK Zing! Oh my they are just adorable!!! These are super SWEET!!! Grabbing the photo for the YNS website and I'll post them on FB too!